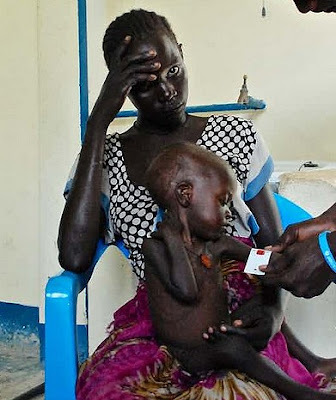 According to the United Nations, South Sudan, which gained independence from Sudan in 2011, faces its "highest level of food insecurity." About 7.5 million persons, almost two-thirds of the population, need humanitarian help. In some areas, half the inhabitants are malnourished. "I buried my little baby under a bush," said Mary Cholil, who sought food and shelter after his village was burned, talking about his deceased three years old daughter. I have to be quick before it's too late. Before I get used to the thing, and it will decide to stay. The thing, yes, I don’t have to give it a name, otherwise it gets familiar, close, mine. I cannot afford it, not now, not me. Here it is, I look at it for a moment, with strictly fixed-term feelings and thoughts. A woman burying an only three years life under a bush. Now, fast, I take the picture and hide it. There, down there, there's a pile of things like that, in that corner of the memory that sooner or later I will bleed somewhere. Well, under everything, perfect, so good. No, no way, I made that mistake again! Why did it happen all the time? Now there's another picture to bother me. Me, there is me in it, with the photograph evoked by the usual, horrible news, while I commit to conceal it where I can easily forget it. Hurry, I have to be rapid. By now I should be good at doing everything with extreme swiftness. I take the compromising image that represents myself burying the picture of the mother doing the same with her lifeless daughter. Where should I throw it? Well, always there, down there, on the blind side of the common, collective consciousness, which, as a social network of sloppy profiles, it tells us where to look and what to censor. Oops... am I crazy, or what? It's a bad dream, it's literally a nightmare, what I'm writing and desperately wanting to desert from my recent memories. Because I'm finished in the nth, paradoxical moral loop. I close my eyes and I see the thing, which now gets bigger and more intolerable. The scene where, convinced of being invisible, I am inclined to eliminate it from my personal horizon when I tried to do the same with the original sin among the vilest leaks from reality. That is, hiding in real time, confusing my soul, distracting myself, falsely persuaded to keep away the uncomfortable side of the screen from eyes and heart. Quickly, I must be quick to reach the end. I have to get out of this damned page as soon as possible. Where you, woman and mother who buried your youngest life, are looking at us.